Ever since I was a little girl I have loved sewing. I have always admired the talents of family members from Mam's perfect cross stitch samplers, to my Auntie's dress making talents, my Cousins cute teddy bears and upholstery skills, Grandma's knitting and Granda's ability to fix anything! 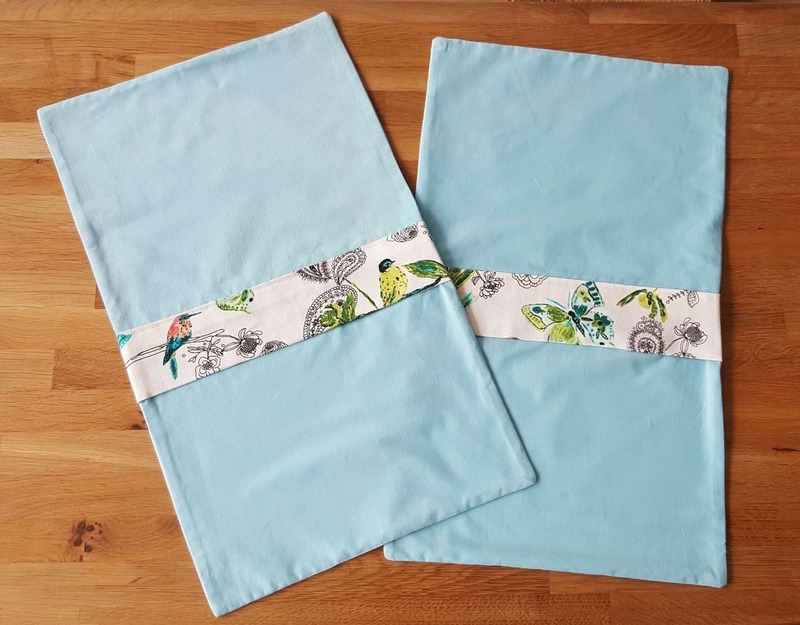 Sewing and craft making is most certainly a family tradition passed from generation to generation. 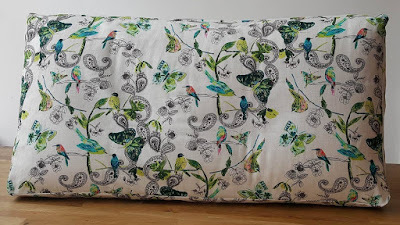 One of my most recent projects has been to make a cover for a rather large sofa back-rest cushion for the lovely Erica. Because of its shape, a box cushion was going to be the best option. Picture courtesy of Annie at The Village Haberdashery where you can buy this gorgeous material as well as others from the collection. 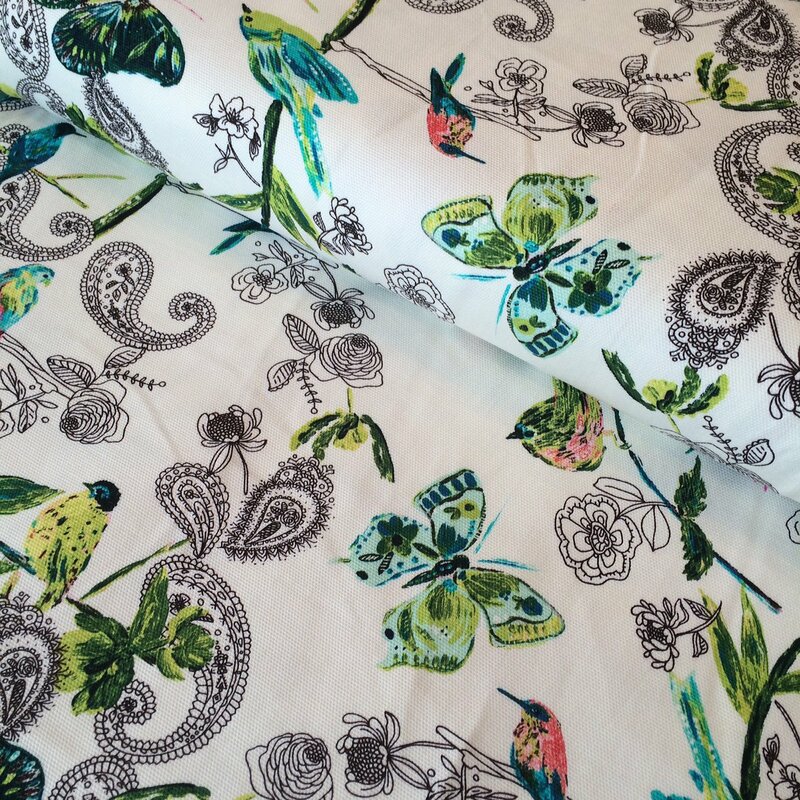 The fabric Erica chose is a truly stunning design by Bari J with Art Gallery Fabrics from her Joie de Vivre collection. 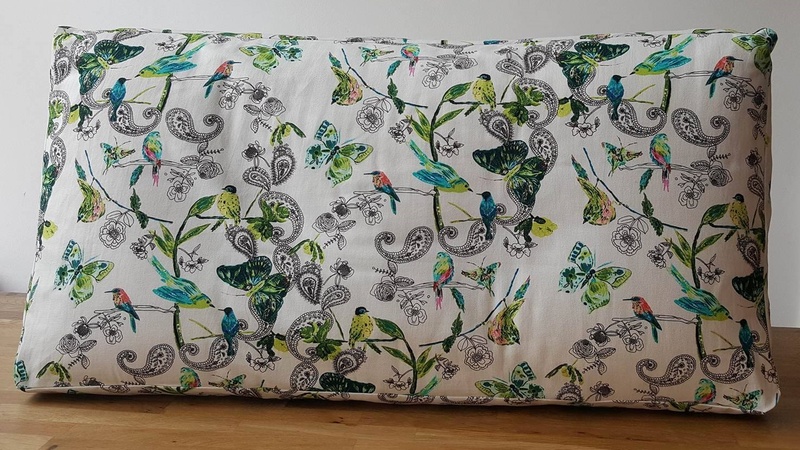 This print, C’est la Vie in Winter, is printed on 100% cotton canvas and features butterflies, birds and swirling branches. 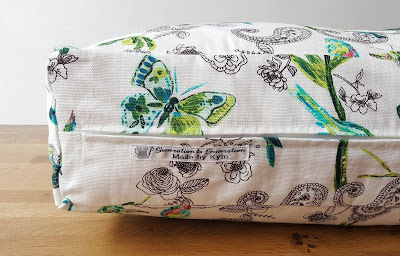 It is a gorgeous design and a lovely fabric to work with. One of Erica’s requests was that it should be easy to wash so I pre washed the fabric before starting to eliminate any initial shrinkage. It washed really nicely in the machine on a cool delicate setting. Best to press whilst still damp to avoid any persistent creases tho (as with any canvas). I thought for a while about the best place to put the zip and what type of zip to use. As this cushion was for a back-rest I decided in the bottom panel was going to be best so it wouldn’t be seen. However I couldn’t find a zip long enough! 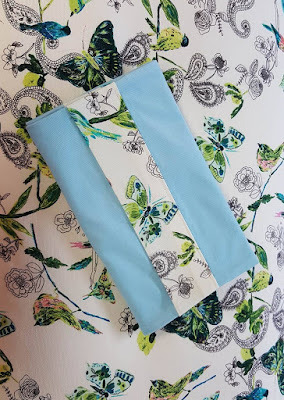 This is when I discovered my new favourite sewing notion… Continuous Zip!!! It was my cousin, who also sews, who mentioned it to me (thanks Sarah!). Continuous zip is exactly what it sounds like, a continuous piece of zipper tape that you buy per metre and cut to length then thread on the zip pull. Perfect for this project! I found threading on the zip pull a little fiddly at first but with a little help from you tube (!) it was actually quite easy. 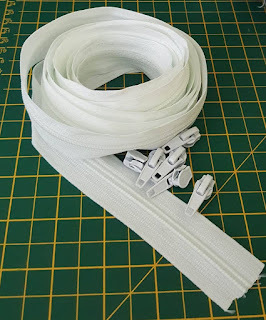 Another great tutorial I found was from The Campervan Converts blog. 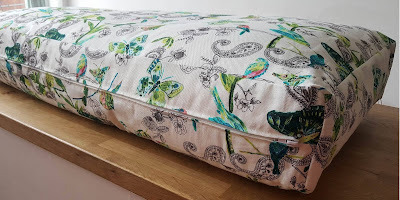 Because the cushion was so large the width of the fabric was not long enough to be able to have just one piece for the border as with a standard box cushion. 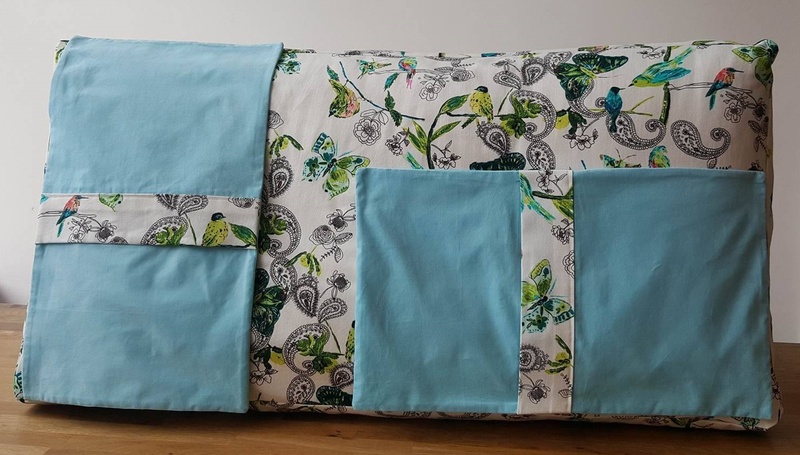 I decided it would be best to have a separate piece for each side of the border (two sizes, one top, and the zipper panel) to avoid any random looking seams. 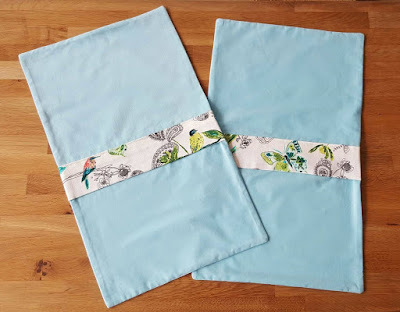 I loved reading The Campervan Converts blog post about how they had learned to sew by making seat covers for their campervan, and I picked up a few extra tips along the way. Check it out here. I love how there are always lots of different methods to choose from to achieve very similar results. As a sewist you never stop learning! 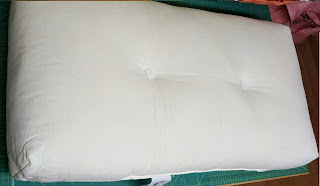 In terms of finishing the insides of the cover, for this project I overlocked all the raw edges before sewing anything together and double stitched all the seams to make it extra strong. Erica also picked out some beautiful blue corduroy for some pillow covers to match. The fabric is Cloud 9 Floritopia in Pool designed by Elizabeth Owen. 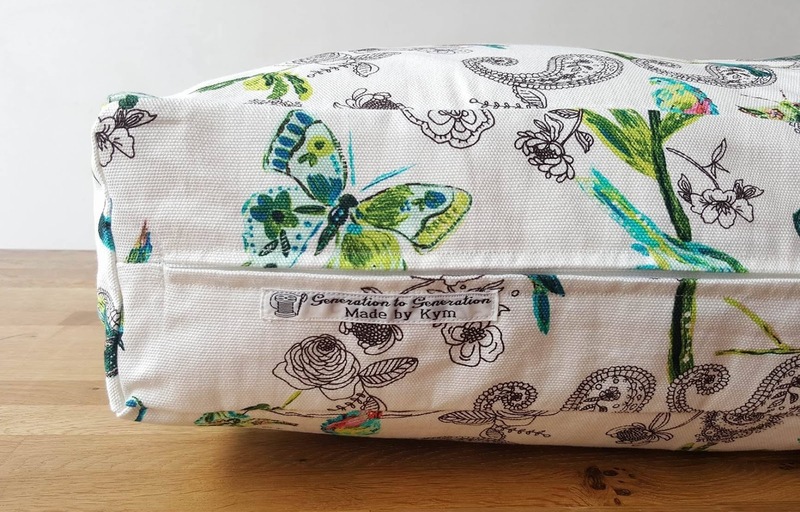 It is 100% organic cotton and has such a lovely feel. I made two envelope back covers trimmed with the Joie de Vivre. The two fabrics complement each other so so well. Excellent eye for colours Erica! I really loved working on this project as I learned some new techniques and the finished piece turned out even better than expected. I hope Erica is enjoying the new additions to her living room!